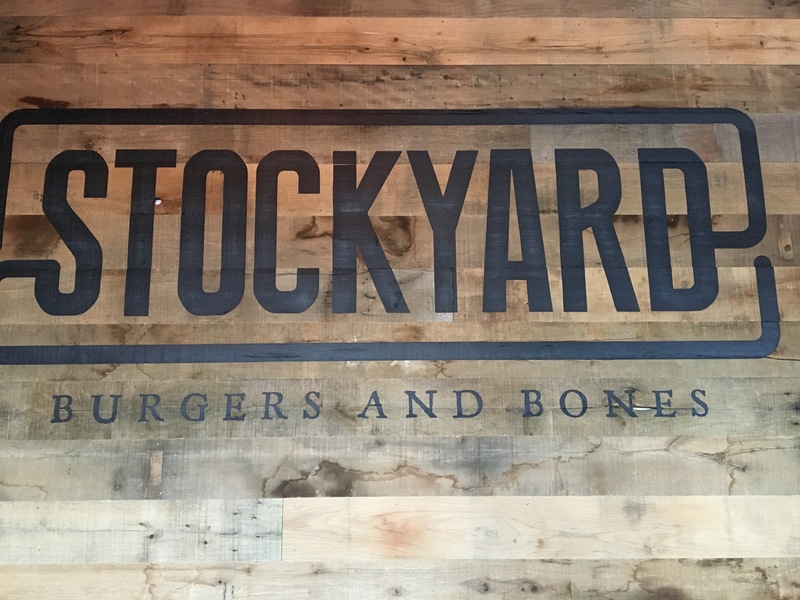 Stockyard Burgers and Bones recently opened another location near Date Night headquarters in East Cobb. 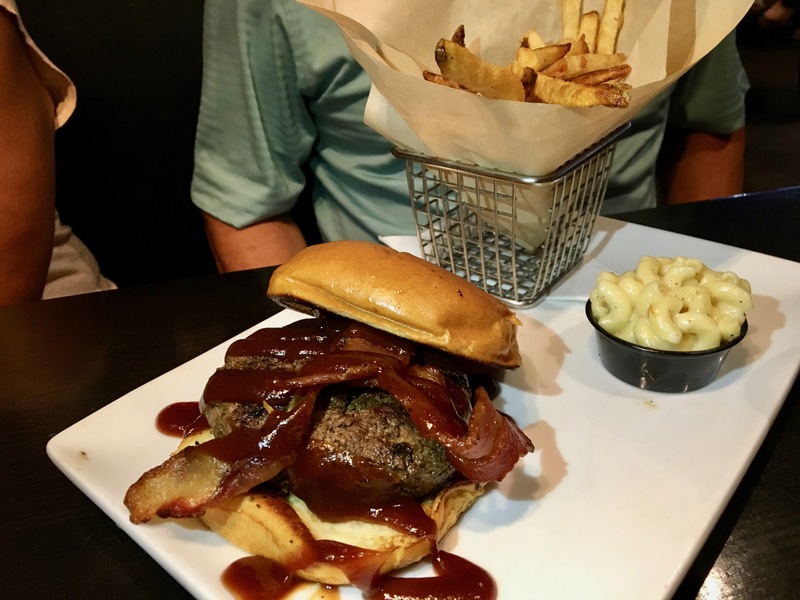 We were excited to discover this as we enjoyed our previous visit to the Stockyard on the Marietta Square. Stockyard is in the Avenue of East Cobb, a swanky development that houses Eve’s favorite store, Eddie Bauer. You can smell the ghosts of burgers past here as it used to be a Johnny Rocket’s. Then it was empty. Then it was a pizza place. Then it was empty again. Now the Stockyard has moved in. So goes the restaurant business in East Cobb. We first visited here right after they opened and it was pretty disastrous. We had to wait over 15 minutes for our beers and about 40 minutes for the food. 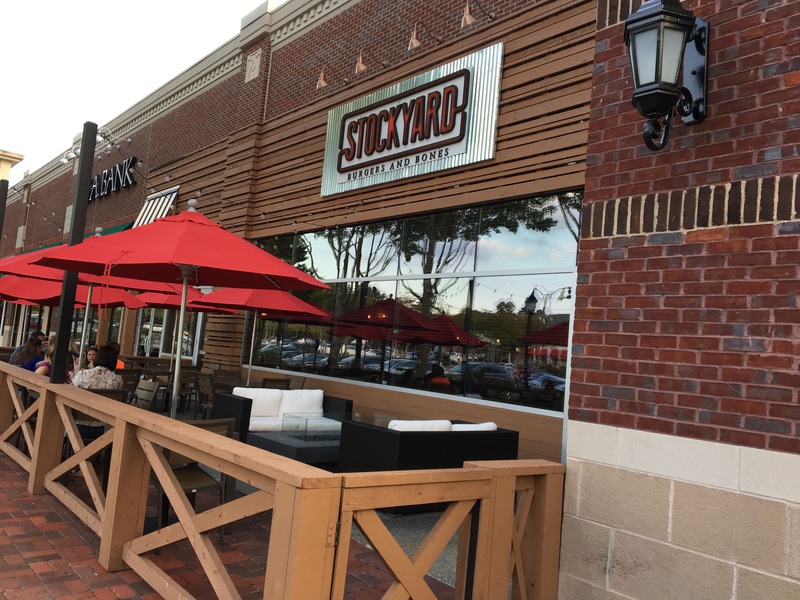 Since our pictures were a little blurry that night, we decided to give Stockyard a pass and not do the review since they were so new. Now we are back, dragging the East Cobb Dining Society along, which means our pals Stefanie and Bill are joining us tonight. That way we get more food photos. Or we order too much food. When you walk in, you notice all of the taps behind the bar, probably left over from when the pizza place was here. Unfortunately, not all of the taps are hooked up and there are only eleven on tap tonight. If we all drink more beer, will they make more of the taps work? Again, it takes about 15 minutes to get our beer. They are not that busy tonight, so we can’t blame the crowd. 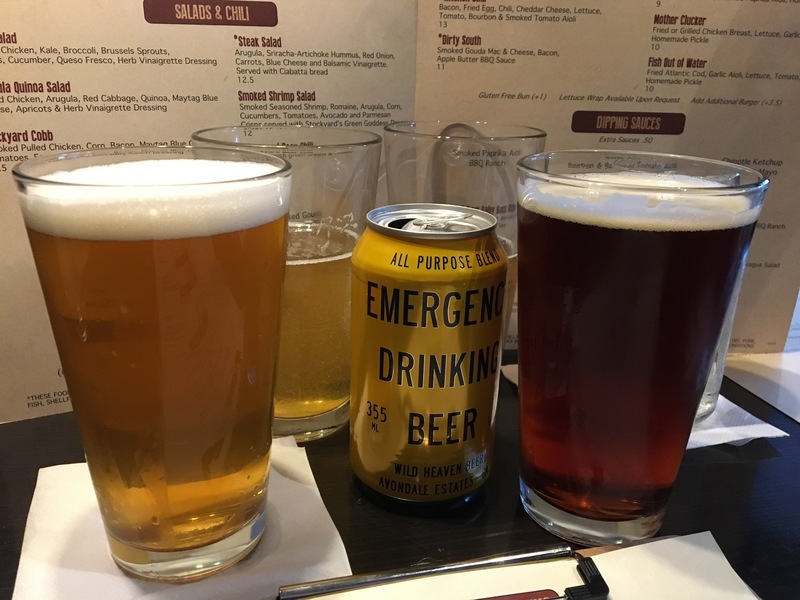 When we ask about the wait, we are informed that there is no bartender and the staff pours the beers when they get a chance. Maybe that’s not the best way to run a bar. We may have gotten our appetizers before we got the beer. It was close. 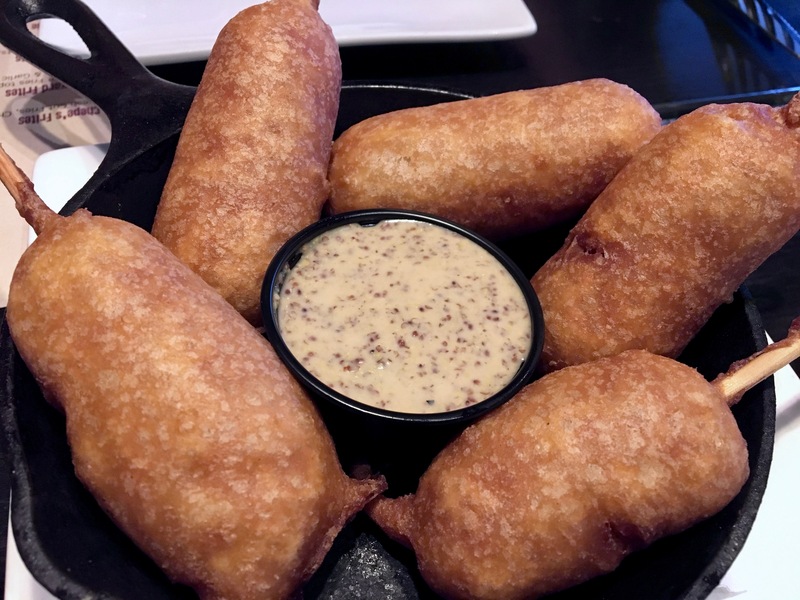 Check out these house-made all-beef corn dogs. These things are huge. And so good that a vegetarian might try a bite. 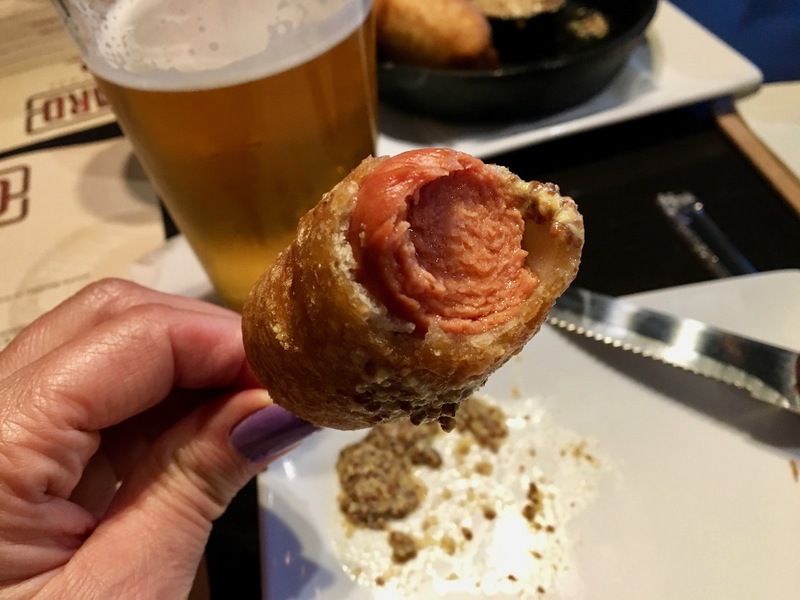 You could make an entire meal from the appetizer and go away satisfied. We also get an order of hummus. It’s nice and creamy with just the right amount of spice. 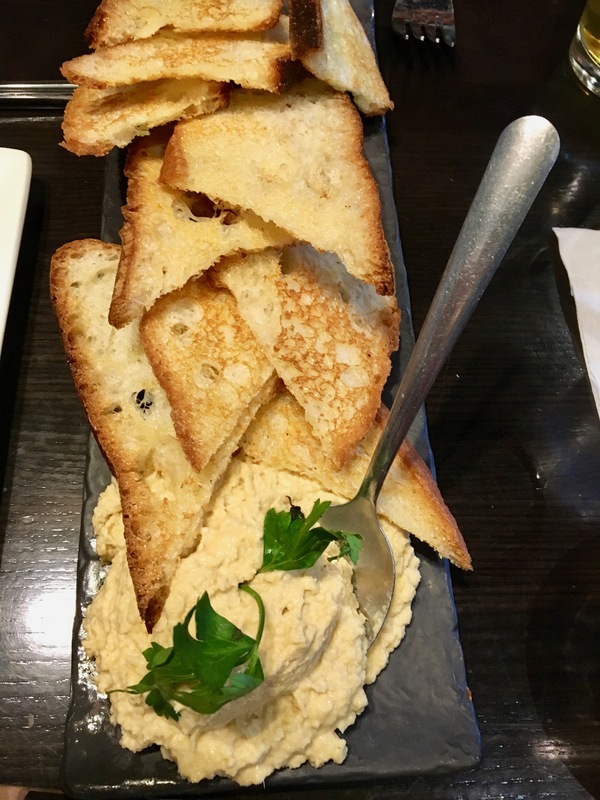 The toast is nice and crunchy, and there’s enough of it so we don’t run out of hummus before we run out of bread. And now it’s time to bring on the Burgers. If it’s in the name of the restaurant, you had better have a good burger. 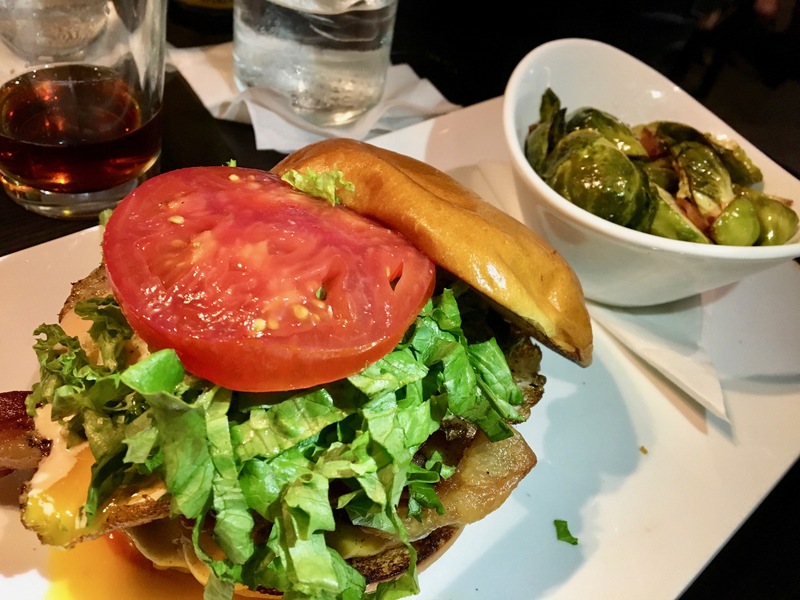 My date is not plain, but her burger, the Jane’s Not So Plain is. The next burgers are not so plain. Like Bill’s Dirty South. This one adds smoked gouda mac and cheese along with lots of bacon and BBQ sauce to the beef. You don’t necessarily have to put beef in your buns. Other choices are fish, lamb, tuna and chicken. 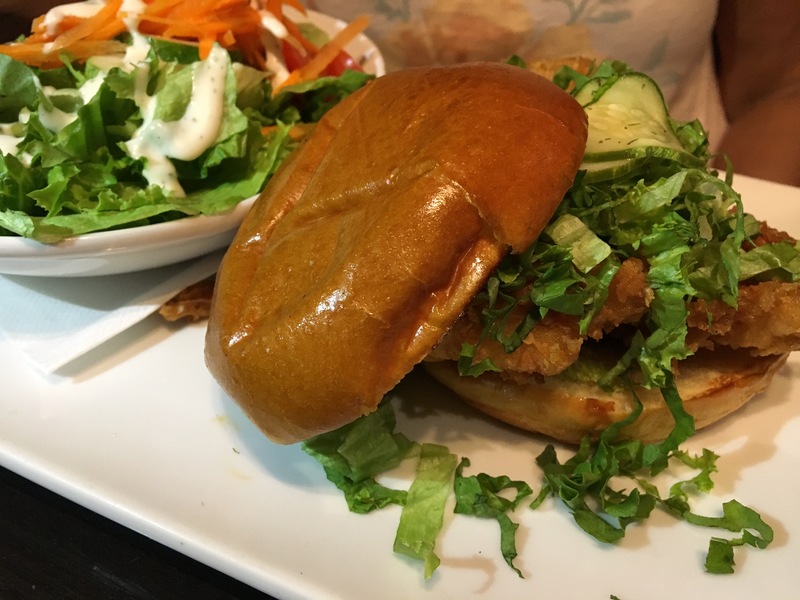 Stefanie’s comes with pickles and lettuce. She even gets a side salad. So healthy. Other sides include sweet potato tots, frites, and brussel sprouts. You may see some on my plate. Meet the Kitchen Sink. 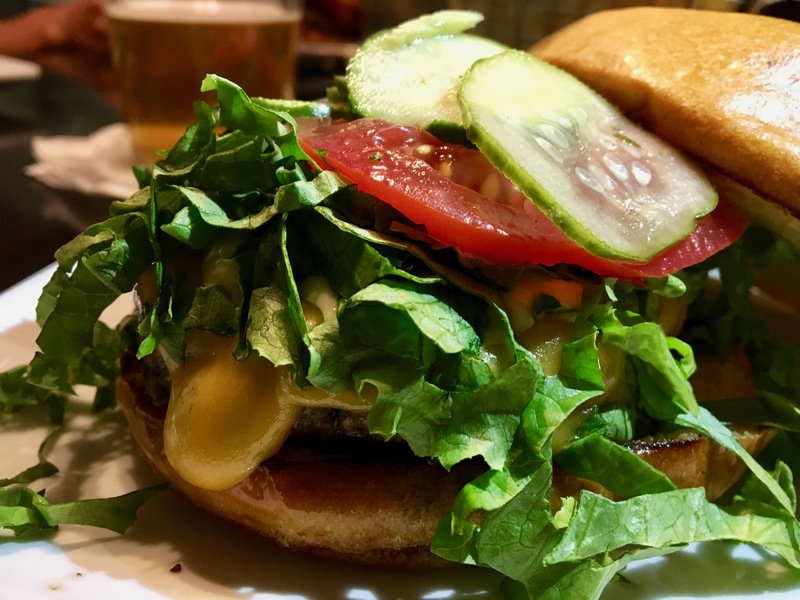 It was hard to photograph the burger. We should have moved some lettuce so you could see the bacon, fried egg, chili and cheddar lurking beneath it. As you can imagine, this is one hot mess. The egg and chili run all over the place, making it a three-napkin meal. It’s a cholesterol-lovers dream date. 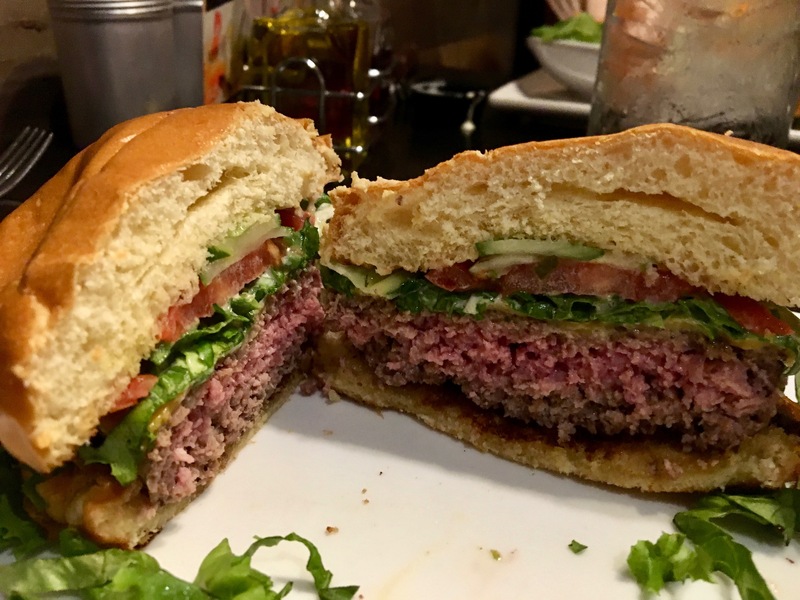 The bottom line on Stockyard Burgers and Bones: We all really enjoyed our meals, presented “between buns”. The kitchen has their act together, but the front of the house needs some help. Like a bartender to start. 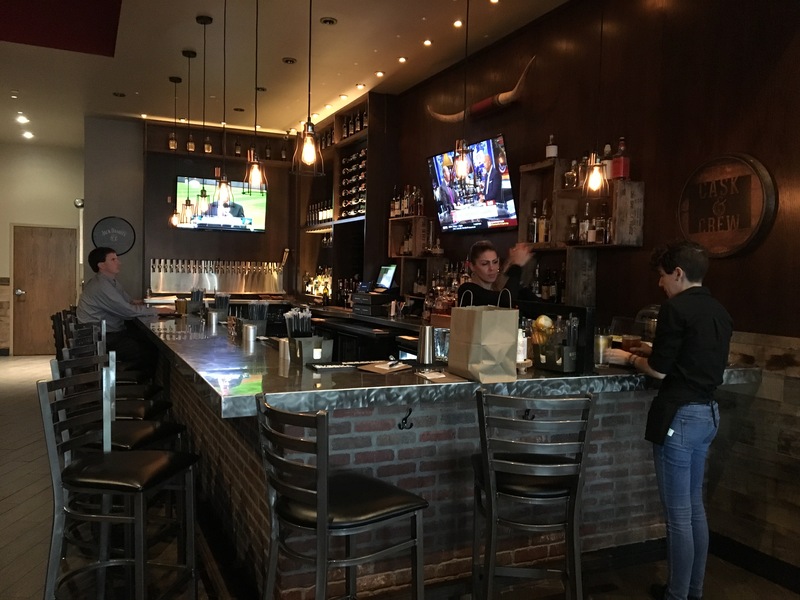 The fickle East Cobb diners will not put up with having to wait so long for their drinks. You can’t make a bad impression on the first thing that people order. Anybody need a job?